The original Oregon trail was a very endearing simulation/edutainment/puzzler interactive experience, in which you had to see your family traverse the historical Oregon road, so as to seek your fortune and a better place to live. Not the kind of game that was very action oriented, but it was quite intense for other reasons; mainly because luck had a lot to do with how each new session with the game went. You could end up prematurely dead due to some stupid accident, or you could get maimed, or your cart could just lose a wheel. It was a game that was both funny, as well as very gory, in a non violent, non graphical manner! So, if that kind of a gameplay mix is interesting to you, you will get exactly that kind of a thing in this game here too; only that except for 3 colors and pixels the size of Texas (!) you get a modern game, one that is in tune with the graphical advances of the mid 90s. Thus, the game is much more simple to play (mouse controllable) and so you can experience it without being a computer guru. The Oregon Trail II is thus a must play for people that can't be bothered with oldschool values but still want to see what all the fuss is about! 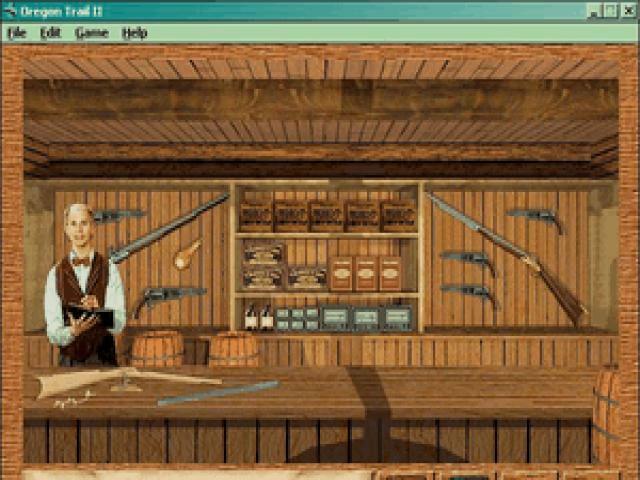 The game is much advanced than oregon trail 1, you choose your party, stroll around town trading or buying goods. Then you leave beating the odds and racing against winter. Making decisions on the way and sometimes losing companions you may finally reach the Oregon state. If you Like this game you should also try the Yukon trail and the Amazon trail.